“The way Sébastien and Julien tackled this event has just been extraordinary. It was an incredible performance right from the start and what they achieved from their road position on Friday was amazing. Then on Saturday afternoon, we saw Sébastien at his best. In my opinion that has to be his best drive since joining the team – going from fifth to first in the space of a day was quite remarkable. 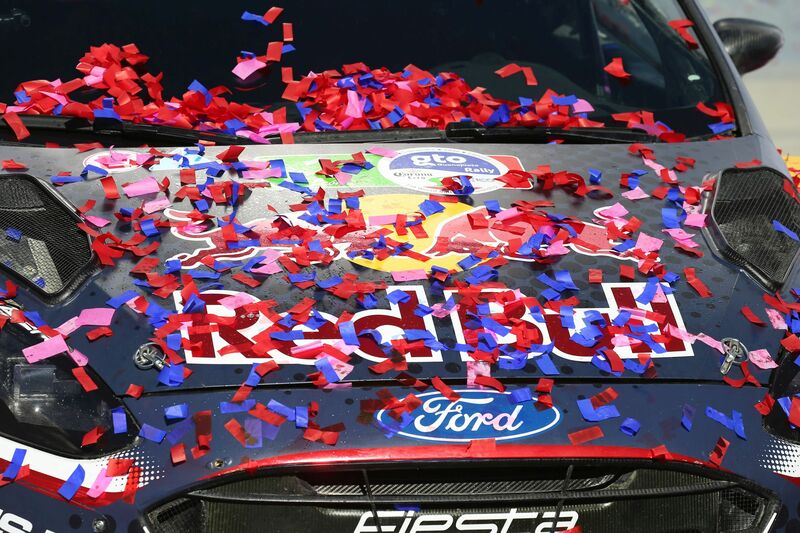 Sébastien Ogier and Julien Ingrassia have taken their fourth Rally Mexico victory – on the tenth anniversary of their FIA World Rally Championship debut. The French pairing have long had an affiliation with this event, and that continued this weekend as they displayed all the attributes of a five-time World Champion. Patience, focus, speed and determination – Ogier had it all as he overcame the disadvantage of an unfavourable road position through the opening stages. Making the best of every situation, he chose his moments perfectly. Whilst having to contend with some of the loosest gravel through the opening speed tests, a stunning drive saw him limit the potential time loss – ending the day just 31 seconds adrift of the lead. With a slightly improved road position on the second day, he pushed hard – four fastest stage times transforming fifth place and a 31 second deficit into first place and a 35.9 second advantage. Embarking on the final day of competition, Ogier not only managed but increased his advantage – securing a second victory for the EcoBoost-powered Ford Fiesta WRC by more than a minute and regaining the lead at the head of the championship standings. “I’m super happy today and this win is a fantastic way for me and Julien to celebrate our tenth year anniversary in the FIA World Rally Championship. It started in 2008 with a win in the Junior category and so many great things have happened here since then – this win, I think, being one of the best. “This weekend we really gave it everything. Julien was perfect, and the team were so strong as well. The victory is great of course, but it’s the performance that was really good. We’ve made such a big improvement from last year, and that is a big positive for the rest of the season. “I was pretty much on the limit all weekend. When you’re early on the road you’re trying your best but the time is still far away from those starting behind. There’s always some frustration coming with that, but you have to keep going and not give up. “That’s what we did, and on the second day – when our road position was a bit better – we kept pushing and were able to take the lead in the afternoon. How would you assess this first rally of the season on gravel? Well, Kris’ third place is obviously positive in terms of points as it means that he moves up the standings in the drivers’ world championship. It is also our second consecutive podium this year, which suggests that we are certainly moving in the right direction, and it also means that we have closed to within just one point of second place in the manufacturers’ world championship standings. Having held the overall lead for a while on day two, and even had both C3 WRCs briefly in the top three, we might well have hoped for an even better result, but that’s racing for you! Yes, that’s the least you can say! We know all about their talent, but they have literally blown us away here, even managing to set fastest times on stages that they have not contested before and taking the lead right in the middle of the battle. On that basis alone, they definitely deserved a podium place. It may seem slightly perverse for nine-time world rally champions, but they paid a heavy price for their lack of knowledge of the tyres now used in the WRC when they had their puncture. Let’s hope that it’s only a matter of time and they get their podium place at the Tour de Corse! In light of the performance they produced this weekend, I can’t really see how they won’t be just as able to get among the frontrunners. What is your view of the performance of the team? I would like to take this opportunity to warmly congratulate each and every one of them because they have all produced high quality work! With eight stage wins at a rally renowned for being one of the most demanding for the cars – but also for the human body – due to the altitude and the heat, we finished the event as best performer among the manufacturers, which shows how extremely competitive we are. And what’s more, we did it without the slightest technical problem. That’s not a question of luck, it comes down to relentless hard work and dedication. It is also yet further evidence of the constant progress made by our C3 WRCs. A stunning performance from our Spaniards Dani and Carlos resulted in a well-deserved podium result in Mexico, as we claimed our best result in the gruelling gravel rally. On another dramatic and incident-filled day, our #6 crew grabbed second position to register our third top-three result of the season. With Andreas/Anders taking fourth place and Thierry/Nicolas in sixth, we extended our lead in the WRC manufacturers’ standings to 12 points. A job well done! Starting the day in third place, Dani was keen to push for second. In the end, the position came to him after Kris Meeke lost time on the opening stage of Sunday morning. The result was his best since finishing second in Spain 2016. Andreas and Anders picked up two extra points in the final stage to take his season-to-date total to 35, and to move up to third in the standings. Thierry and Nicolas also gave a push in the Power Stage to keep the pressure on rally winner Sébastien Ogier in the championship hunt. The WRC moves back to tarmac in April as Corsica hosts the fourth round of the season from 5-8 April.